With more than 2,400 exhibitors, the Show is segmented into 12 sections spread throughout the halls and grounds of the Las Vegas Convention Center. Register For The Show—SEMA Show online registration is $40. The badge is your all-access pass to the Show and many of its attractions and special events, including entrance to the New Products Showcase one hour before the Show opens each day, and free entrance to the SEMA Ignited after-party. Review The Show’s Floorplan—With more than 2,400 exhibitors, the Show is segmented into 12 sections spread throughout the halls and grounds of the Las Vegas Convention Center. To navigate the Show and achieve your goals, you need a plan. Find the location of exhibitors you want to see by using the 2016 SEMA Show floorplan. The New Products Showcase is the SEMA Show’s No. 1 destination. New Products Showcase—Visit the SEMA Show’s No. 1 destination. The 2016 New Products Showcase will once again be located on the Skybridge between Central and South Halls, opening Tuesday through Friday at 8:00 a.m. Free scanners are available, which will allow users to get instant product information, including the exhibitor’s booth location. Friday Is Still Better—All exhibitors are ready to do business on Friday, from 9:00 a.m.–4:00 p.m. at the Las Vegas Convention Center. The New Products Showcase, Ford Out Front, GM Proving Ground, SEMA Central, West Coast Customs Experience, Baja 1000 Score Exhibit, Optima Alley, Hot Rod Alley, Continental Tire Extreme Experience and Arctic Cat are also in operation on Friday. With the SEMA Battle of the Builders® competition, SEMA Cruise and the official industry after-party—SEMA Ignited—Friday will once again be the best day of the Show. SEMA Show Mobile App—The official SEMA Show App is available for download from each mobile device’s native app store. The mobile app contains detailed exhibitor information, interactive floorplans and up-to-date event and education information—all from the convenience of your mobile device. Featuring a 50th anniversary theme, the 2016 app is a great way to maximize your time at the Show. The mobile app, which essentially puts the entire SEMA Show in your pocket, can also be downloaded. More than 500 new exhibitors will join this year’s Show from every market. There’s always something new to see and new connections to make at the SEMA Show. Each year, hundreds of companies attend the Show for the first time, providing buyers with access to more companies and products to meet the demands of their customers. The Show’s 12 sections represent an immense spectrum of specialty equipment, and more than 2,400 exhibiting companies will be in attendance, including more than 500 new exhibitors who are joining this year’s Show from every market. Located in the Westgate and Performance Pavilion, the First Time & Featured Exhibitors sections were created for first-time exhibitors and exhibitors displaying products typically found in other sections of the Show. These areas showcase companies that are new to the SEMA Show and are one-stop shops to all new and innovative brands. 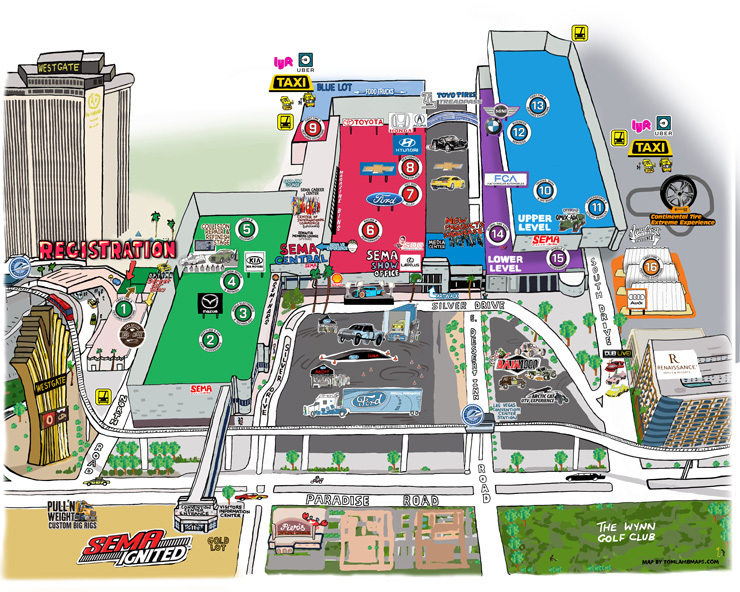 To view all of the first-time exhibitors and their sections, view the SEMA Show floorplan. Complimentary shuttle service to the AAPEX Show at the Sands Expo Center will run every 5–10 minutes, Tuesday–Thursday, from 7:30 a.m.–6:30 p.m., Friday from 7:00 a.m.–10:30 a.m., 2:00 p.m.–5:00 p.m. (no midday service). Pick up/drop off locations will be at the east end of the Performance Pavilion and North Hall Door 10. Shuttle service to McCarran International Airport will run every 30 minutes on Thursday, November 3, from 7:00 a.m.–6:30 p.m. and Friday, November 4, from 7:00 a.m.–5:00 p.m. The airport shuttles will pick up at North Hall Door 10 and the east end of the Performance Pavilion. The one-way trip cost is $10 per person, cash only. Pay at the bus. The LV Monorail has extended its hours for the SEMA Show. Board the Monorail as early as 6:00 a.m. Tuesday–Friday. Service continues until 2:00 a.m. on Tuesday–Thursday, and 3:00 a.m. on Friday. With a station location right in front of the LVCC, the monorail is a fast and easy way to travel from the Strip to the SEMA Show. Purchase your discounted tickets in advance at tickets.lvmonorail.com/sema2016 or visit a Monorail station. There are two designated drop-off and pick-up areas during the SEMA Show. These transportation hubs are located on the east side of the Performance Pavilion and in the Blue Lot on the east end of the Grand Lobby, adjacent to the Central Hall. Designated drop-off/pick-up locations will be available for Showgoers using Uber or Lyft to get to and from the LVCC. Seventy-two percent of last year’s education session attendees said the SEMA Show conference tracks were the best way to keep up with the latest industry trends. The vast diversity and innovation-driven focus of the SEMA Show makes it an unparalleled platform for stimulating and exchanging ideas that will challenge and equip both individuals and businesses to meet the needs of today while preparing for the opportunities of tomorrow. The SEMA Show education program typically includes more than five dozen sessions. Topics will focus on industry trends, technologies and opportunities, while also addressing basic business practices, such as customer service, accounting, marketing and social media. 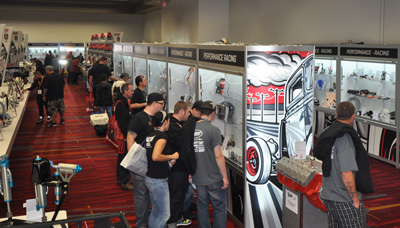 View the SEMA Show Education Days schedule. Many SEMA Show exhibitors will host an industry icon, TV personality, celebrity or famous vehicle in their booths. View the complete schedule of celebrity appearances at the 2016 SEMA Show. The 2016 SEMA Show art and graphics have received a makeover, courtesy of the pencil stylings of famed automotive artist Ed Tillrock. Located in the Central Hall pre-function area, the SEMA Show Art Walk is “the place where we encountered the artwork of Ed Tillrock, this year’s Show artist, and Max Grundy, who preceded him in designing our Show art,” said Tom Gattuso, SEMA Show director. Art Walk visitors will be able to meet and network with exhibiting artists, see their latest creations and even take home artistic souvenirs for the office or home. We want your SEMA Show experience to be as easy and enjoyable as possible so that you can concentrate on the important things, such as seeing new products, getting new ideas, discovering new trends, meeting new exhibitors and checking in with your favorite exhibitors. The SEMA Show Strategy Guide is filled with recommendations and suggestions for booking your travel to Las Vegas, ground transportation options, places to eat well but inexpensively, free entertainment hot spots, suggested tipping amounts and more. Not registered for the Show? Don’t miss out on the best business opportunity of the year. Register now. For more information about the 2016 SEMA Show, visit www.SEMAShow.com.